Bob Baldwin claims the term New Urban Jazz and with 16 smooth jazz albums he certainly has the legitimization to sail under this flag. With his new album NewUrbanJazz.com 2 Re-Vibe (2011) he also promotes his nationally syndicated radio program The NewUrbanJazz Lounge presenting a unique mix of smooth jazz and R&B. The starting track Thanks for Stoppin By is a tribute to Baldwin's weekly audience of over one million listeners. The coolest place on radio. A sample, every DJ wants. When saxophonist Freddy V., trumpet player Barry Danielian and keyboardist Baldwin meet for a jam session, the music is buzzing with excitement. Uptown Situation has it all - passion, energy and electricity. Baldwin establishes a fast paced rhythm to attain peak performance on Get Over It. Ragan Whiteside on flute shares the wild ride. For Grover and George is dedicated to Grover Washington Jr. and George Howard, two Philly legends. The honor to remind of Grover goes to young lion Darren Rahn, who already earned a lot of merits in the past years. Alicia Keys wrote Unthinkable for her album The Element of Freedom (2009). Trumpet player Joey Summerville and Bob Baldwin on keys reproduces in their subtle rendition the chart leading song. All Over You features R&B singer Glenn Jones, who had success in the past with the hit singles Show Me and We've Only Just Begun. Glenn never changed his style since his move from Gospel to R&B in the '80's. It's popular today to combine jazz and rap. Get a Little (Jazz in Yo Ear) featuring rap singer Bo Valentine is no exception. Personally I prefer Ragan Whiteside's harmonic vocal contribution. On Cosmic-Tology Baldwin brilliantly expands on his Yamaha keyboard. Those who visited Arabian countries like Morocco or Tunisia, knows how sugar-sweet Arabian Sweets are. Baldwin showcases his own imagination of Arabian music. With mighty keyboard wizardry he presents the up-tempo Burnin. Music is all about emotion and who can celebrate it better than Porter Carroll, Jr. on Are You Ready? As drummer and one of four singers, Porter Carroll Jr. helped make the hits that made Atlantic Starr and its amazing vocals, tight production and energetic stage performances famous worldwide in the 1970s and 1980s. Let the drum machine work for the money. It can keep good time and won't sleep with your girlfriend. On the pulsing rhythm of Re-Vibe Bob creates a seductive groove. Applause! Joey Sommerville is an excellent trumpet player, undeniable. Every Breath Is a Gift is the perfect prove for it. With Morning Bob waves his subtle Goodbye. 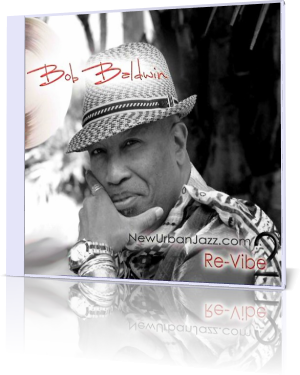 NewUrbanJazz.com 2 / Re-Vibe is not just a CD or a radio program, it's the embodiment of Bob Baldwin's musical life.